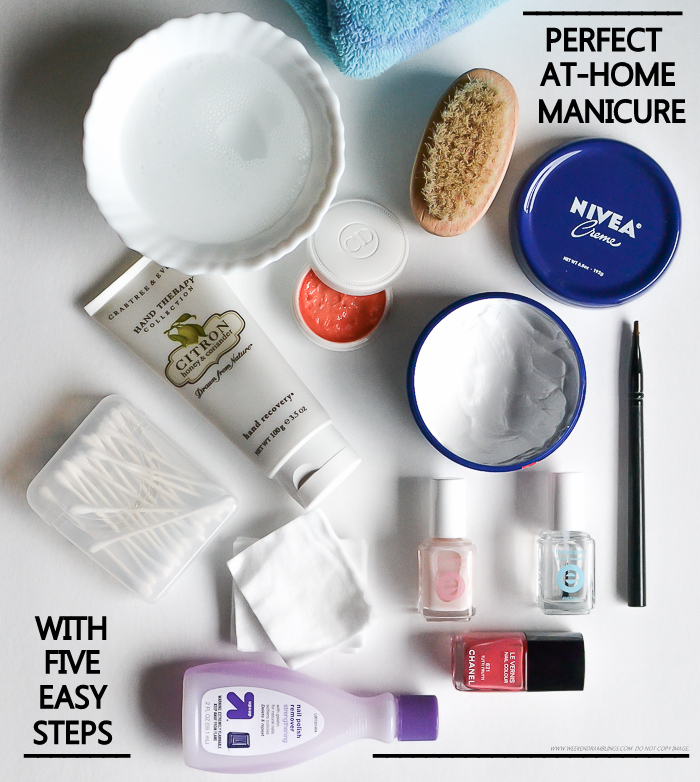 Start by removing any old nail polish and then washing hands in warm water. Wipe dry with a soft towel, ensuring that the hands are completely dry. Then, trim and file nails to the desired shape. I keep my nails short and like the slightly oval shape that my nail tend to grow to on their own, so this doesn't take too much time for me. Once satisfied with the nail shape and length, move on to the rest of the manicure. 1. Add a few drops of olive oil to warmy soapy water in a bowl and soak your hands in this (work on one hand at a time). If cuticles need some extra love, apply cuticle cream or oil around the nail and then soak. After about 2 minutes, using a cuticle pusher or Q-tips, gently push back cuticles. Apply more cuticle cream or oil and soak for another 5 minutes. For hands that are very dry, use plain water without any soap added in. 2. Following this, wash off the soap with warm water and use a hand scrub for gentle exfoliation. I like to work in small circles, using light pressure to move the scrub particles over the skin. Concentrate the scrub over rougher bits - in my case between fingers. After about a minute, rinse the scrub off. Use a nail brush to remove any bits of scrub or dead skin from around the nails and to clean under the nails. 1. A bowl of warm soapy water, large enough to soak your hand in. 2. A nail brush. I use a wooden brush from Crabtree & Evelyn. 3. Cuticle cream and moisturizer - Creme Abricot by Dior and Nivea cream. 5. Q-tips and cotton: I love these cotton swabs from Target (up and up) for the convenient packaging. 6. 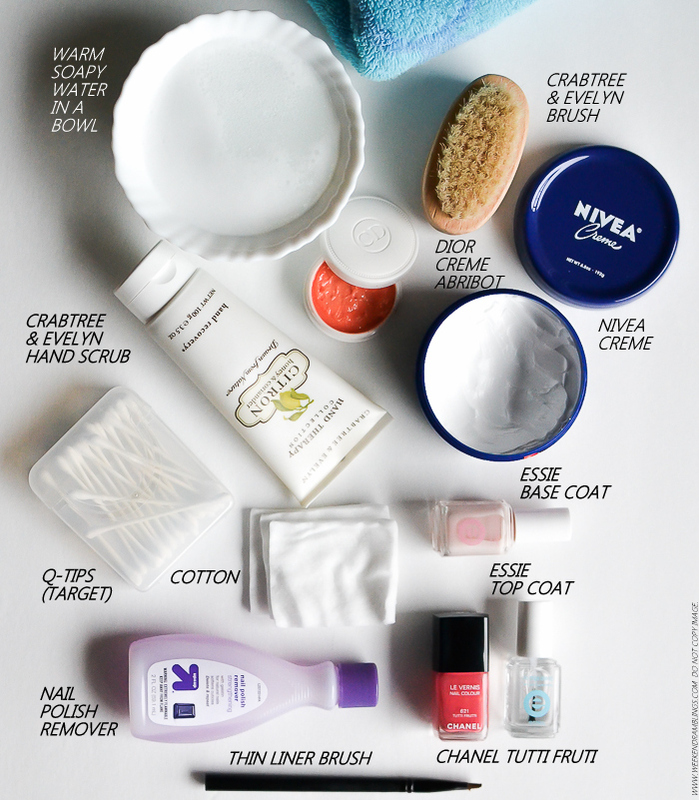 Nail polish remover: To clean up polish around the edges and for wiping down nails to remove any oily residue, I like to use stronger nail polish removers that contain acetone. 7. Nail polish (Chanel Tutti Fruti - a perfect spring/summer coral) and base and top coats from Essie. 3. Apply a generous amount of a heavy-duty moisturizer - I love using body butters or Nivea Creme for this - and massage the palms and back of your hands as well as the fingers. Concentrate the moisturizer over the back of the hands and in the areas between fingers as this is where it tends to be the most dry. Massage in cuticle cream around the nail edges. I like to massage my hands for at least 5 minutes, and if possible, wrap my hands in a warm, moist towel for about 5 minutes. This not only adds to relaxed feeling but also helps the cream absorb better. 4. Once done with the massage, it's time to move on to nail polish application. Pat gently with a paper towel to take off any excess cream from the hands. For longer-lasting nail polish application, it is essential that there is no oily residue left behind on the nails. The easiest way to ensure this is to wipe the nails with Q-tips or cotton dipped in nail polish remover. 5. Apply a base coat, let it dry completely, and follow with your favorite nail color. Use Q-tips dipped in nail polish remover to clean any nail polish that gets on to the skin along nail edges. I like to use a thin liner brush dipped in nail polish remover to get a clean edge around the nail. Once the nail polish dries completely, seal in the work with a good base coat. And that's how easy it is to give yourself a perfect manicure right at home. While this DIY manicure might not match up to the expertise of a trained professional, this is a great way to relax and do something nice for yourself. Turn off the phone, play some soft music, light up your favorite candle, and you can have the perfect spa-day at home.